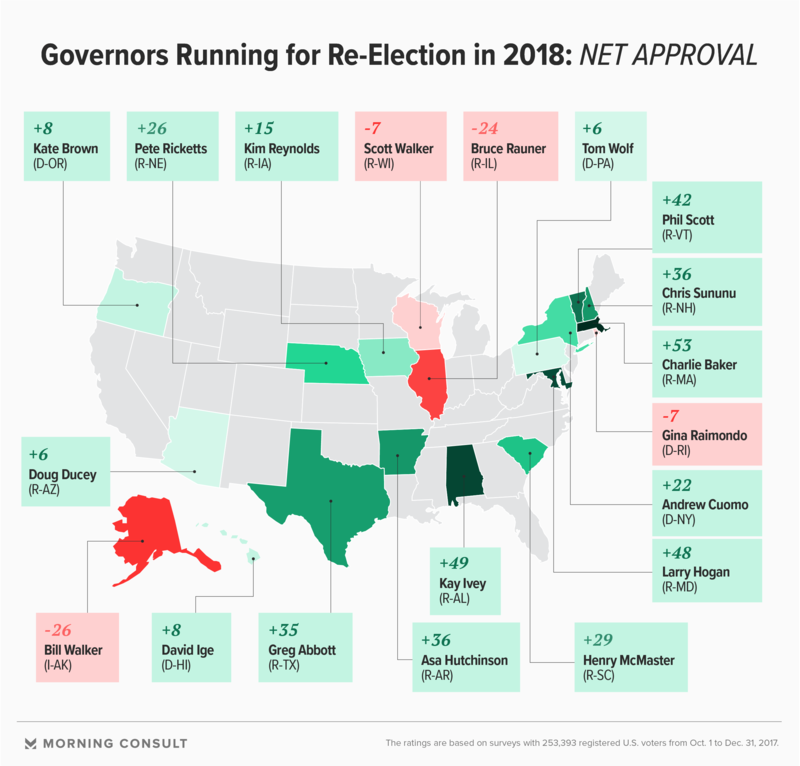 Bill Walker (I-Alaska) is the least popular governor running for re-election this year, with net approval of -26%. 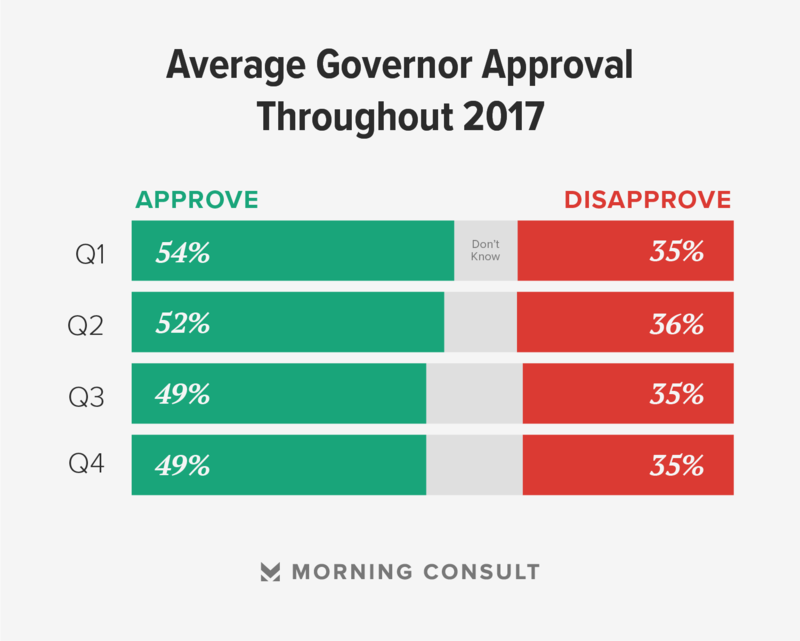 Walker posted the largest net slide in approval of any governor in the fourth quarter, falling 19 points compared to the previous quarter. Gov. Rick Scott (R-Fla.), a potential contender for a Senate run, finished the year 7 points higher compared to prior quarter, with 27% net approval. Things look less rosy for Republican Govs. Bruce Rauner of Illinois and Scott Walker of Wisconsin, who both ended 2017 underwater — Rauner by 24 points (55 percent disapprove) and Walker by 7 points (50 percent disapprove). A Republican-turned-independent, Bill Walker of Alaska, also finished last year in a weak position, as the 10th least popular, after posting the largest net slide (-19 percentage points) of any governor during the fourth quarter. Fifty-five percent of registered voters in Alaska disapproved of his work in office, compared with 29 percent who approved. Among the five Democratic governors up for re-election this year, Andrew Cuomo of New York is more popular than his party colleagues, with 55 percent approving of his job performance. As the 11th least popular governor, Gina Raimondo of Rhode Island brings up the rear of the Democratic list, with 47 percent disapproval. Meanwhile, half of the 16 governors who will head for the exits early next year found themselves among either the most popular or least popular in the fourth quarter of 2017. Republicans Matt Mead of Wyoming and Brian Sandoval of Nevada were the fifth- and sixth-most popular governors that quarter, while Dennis Daugaard (R-S.D.) rounded out the top-10 list. On the other end, Dan Malloy (D-Conn.), Mary Fallin (R-Okla.) and Susana Martinez (R-N.M.) were the second-, fourth- and fifth-least popular governors who are set to call it quits in 2019, followed by Maine Republican Paul LePage (8th-least popular) and Michigan’s Rick Snyder (10th-least popular). The fourth quarter of 2017 also marked the final tally for three governors — Chris Christie (R-N.J.), Sam Brownback (R-Kan.) and Terry McAuliffe (D-Va.). Christie retained his title as the nation’s least popular governor during his last full quarter in office, while Brownback was again ranked the third least popular ahead of his confirmation to be an ambassador in the Trump administration. McAuliffe was in the middle of the pack, with 15 percent net approval, during his final quarter as Virginia’s top Democrat. Rick Scott, Florida’s Republican governor, is nearing the end of his second term and Republicans – including President Donald Trump – are trying to coax him into challenging Democratic Sen. Bill Nelson this year. Scott finished 2017 on an upswing (7 net points) in popularity in the Sunshine State compared to the prior quarter. Fifty-eight percent of voters in Florida approved of Scott during the fourth quarter, compared with 31 percent who disapproved. Scott maintained strong support from GOP voters during the last six months of the year, from 79 percent in the third quarter to 82 percent the following three months. His approval numbers among independents also increased, from 47 percent to 53 percent, along with an 8-point gain among Democrats, during the same time period. In a Tuesday phone interview, Scott spokesman McKinley Lewis responded to questions about the governor’s interest in the Senate race by saying that the Florida Republican had not made a decision and was focused on finishing his work in office. West Virginia Gov. Jim Justice (R) faced a turbulent first nine months of 2017 as he feuded with top Republicans in the state legislature during a protracted budget standoff. But the Aug. 3 announcement that he was rejoining the state’s GOP after roughly two years away — and his victory in pushing a referendum on a road bond plan that sailed through a special session in October — appear to work in his favor during the fourth quarter. The former coal magnate improved his standing among Mountain State voters by 13 net percentage points between the third and fourth quarter of 2017, the largest increase Morning Consult recorded during that time frame. Forty-seven percent of registered voters in West Virginia approved of Justice’s job performance during the final three months of the year, while 39 percent disapproved. He saw jumps in net approval among voters of all stripes, including 14 points among Democrats and 12 points among Republicans and independents. *Brownback, Christie and McAuliffe are no longer governors. They were in office during the fourth quarter of 2017. Clarification: Scott’s spokesman specified in Tuesday’s interview that the governor has not made a decision regarding a potential Senate run.